As the majority of my loyal readers are Indonesian, let me give you a glance where the city of Pula is and why this city is pretty famous among the European tourists and even worldwide as the harbor of Pula is a stop harbor for many cruise ships. Historically, Pula was a part of Italy from 1918 to 1947 and because of that the people from the older generation speak fluent Italian. Pula is one of the coastal city of Istria Peninsula or around 200 km from Zagreb, Croatia's capital. How to reach Pula from Zagreb? The public transportation in Croatia is so good, by bus you can reach Zagreb to Pula or vice versa for around 5 hours. And many low cost airlines fly from few big cities in Europe to Pula, for instance Ryan Air that has a daily schedule from and to Brussels - Pula because the airport of Pula is the biggest in the Istria Peninsula region. Many visitors most of the times passing by Pula without making any stop, they prefer to go immediately to Porec, Rovinj or other coastal cities and beach resorts. Is Pula worth of visit ? Absolutely yes ! We stayed 2 days in Pula, our guest house is located not far from the old town so it s pretty easy to navigate it on foot. To visit amphitheaters around the world is such an ultimate dream. And amphitheater ( known locally as The Arena ) in Pula is one of the most preserved amphitheater there is. Without a doubt, it is a a biggest attraction for tourists in Pula. 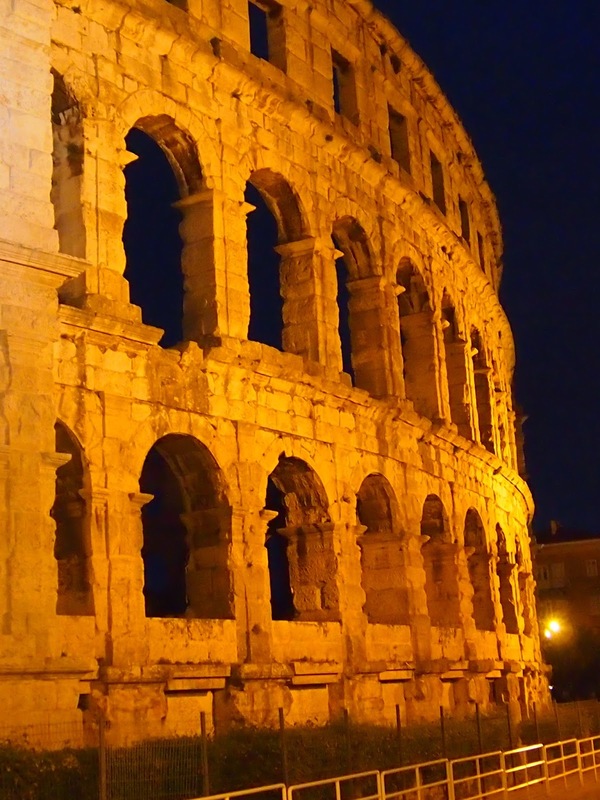 Pula Arena is mentioned as the 6th largest roman coliseum in the world. You can enjoy The Arena simply from the outside or if you want to step on the same ground where the gladiators and 20.000 spectators, you just have to pay €10 for each adult. We have had so much fun in climbing around the bleachers and experiencing the acoustics. Under the chamber, there is a museum about the history of an ancient olive oil equipment and productions. In Pula you feel the ambiance of Roman Emperor all around the city, as Rome to Italy then Pula is sure for Croatia. As its name, this temple is dedicated to Emperor Augustus and the goddess Roma, built in the 2nd century BC. Temple of Augustus was hit by bomb during World War II and destroyed, what you see now is the reconstruction exactly the same as 2000 years ago. Since the Roman left the city, this temple was changed its function into church and then became a grain warehouse. The entrance ticket to The Temple of Augustus is €2 per each adult. 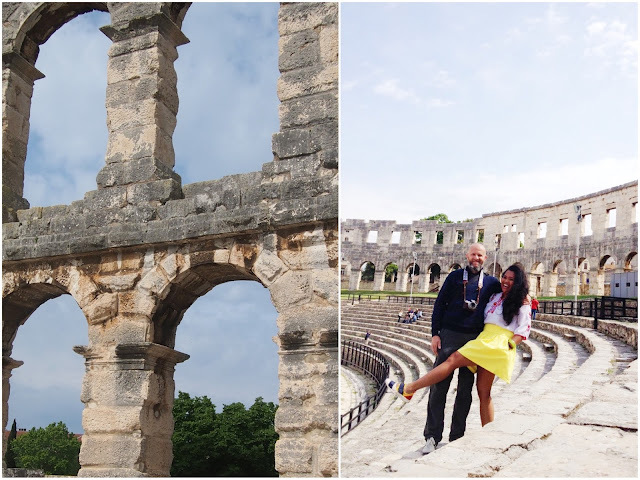 Pula is like an outdoor museum with the vibrant Roman era, to be honest at first we underestimate Pula, but now we glad we did it. Triumphal Arch of Sergius is one of the perfect symbol and richly ornamented of Roman in Pula, also known as 'Golden Gate', this arch was constructed in between 29 - 27 BC by The Sergi Family, hence the name come from. Because it is situated right at the city centre, is is kind of impossible to miss it once you visit Pula. My first experience with Croatian culinary was in Dubrovnik few years ago and since then it is always my 'one of the top fave' dishes in Europe. Arrived in Pula by night, we immediately searched the best place where to have dinner in town. We ve passing by cozy restaurants not far from the harbor, and stopped in one local resto, the old man from the resto mentioned what they have in the menu and we are immediately sold. The culinary in Croatia has largely been influenced by its inhabitants over the centuries and with its proximity to the sea, fresh fish and seafood are obvious specialties. And dont forget to taste the Istrian Wine together with your dishes. Where we stayed in Pula ? Mentioned by booking.com as one of their best seller property in Pula. We met Sara in person when check in and out, a young friendly woman and know how to host. The location of Studio Sara is around 400 meter to The Arena and most sightseeing spot. It s easily reachable from the bus terminal too. She let us stay until 16:00 before our departure by bus to the next city , she even dropped us in the bus terminal and make sure that everything is ok. Recommended! Kalau maen ke blognya Kak Feb ini selalu seru, tempat-tempat yang dikunjunginya warbiyasak! Waduh jadi tau ada yang kaya gini di Croatia.. Dimasukan dulu ke dalam bucketlist. wow, nice journey and nice place. The building look very old but very strong. Sungguh tak dapat membayangkan dulu membangunnya pakai bahan apa saja yah. ha ha. hingga kini masih terlihat kokoh dan gagah.